You are here: Home > BRAND > MOUNT TYPE > 23 to 37"
This mount fits 12-37" TVs (some up to 40”) and Displays with hole patterns up to VESA 200x200 (approximately 8x8”) and up to 40bs. The articulating arm extends up to 15" from the wall giving space for access behind the TV and collapses to 1.3". The unique ballhead motion at the end of the arm mount allows for 360° rotation, making transitions from portrait to landscape orientation possible. This also makes leveling after installation convenient in any orientation. The same ballhead also allows 180° of swivel and +/- 15° of tilt. In addition to wall mounting, the ALAMB can also be ceiling mounted. The base plate at the end of the arm mount fits hole patterns up to VESA 100 for smaller displays. The included "wing" attachment pieces extend the covered hole patterns up to VESA 200. The mount includes a 10’ Twisted Veins High Speed with Ethernet HDMI cable featuring 4K 60HZ 3D signal support and a protective braided jacket. This mount ships with hardware for both wall and TV mounting. All our mounts come with a lifetime guarantee. If you experience ANY issues, please contact us. 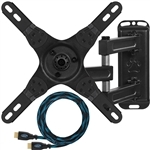 This mount fits 22-55" TVs with hole patterns up to VESA 400x400mm (16x16”) and up to 66lbs. The articulating arm extends up to 20" from the wall giving space for access behind the TV and collapses to 3.25". In addition to wall mounting, the ALAMLB can also be ceiling mounted with a ceiling mount adjustment piece (included). The base plate at the end of the arm mount fits hole patterns up to VESA 200. The included "wing" attachment pieces extend the covered hole patterns up to VESA 400. The mount includes a 10’ Twisted Veins High Speed with Ethernet HDMI cable featuring 4K 60HZ 3D signal support and a protective braided jacket. A 6" 3-axis Magnetic Bubble Level ensures level mounting. This mount fits virtually all 20-80" TVs sold today with VESA hole patterns from 100x100 (4x4”) to VESA 600x400 (24x16”) and up to 165lbs. The APTMM2B ships in an assembled VESA 400 configuration but can be modified with included parts for VESA 600 or VESA 200. This mount ships preassembled for 16” studs but can be modified with included hardware to support 24” studs found in some homes. It can be mounted into all types of masonry. All mounting hardware is included. TV and wall plate attach with a simple lift and lock system. Adjustable pull tabs below the mount allow for easy mount release. The APTMM2B profile is only 1.3" yet still offers some tilt to improve viewing and reduce glare. Due to the low profile, TV's inputs are difficult to reach once mounted. If input access is an issue, Cheetah offers various arm mounts. Slots in the wall plate allow for 3° of rotation adjustment to level the display after mounting.